Sky offers cashback deal on LG 3D TVs | What Hi-Fi? 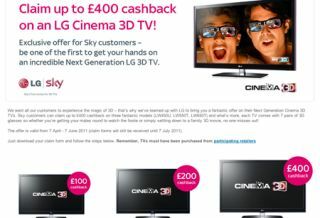 Sky customers can claim up to £400 cashback on a LG Cinema 3D TV between now and June 7th as part of the satellite broadcaster's latest promotion. The offer is available on three LG models: 42LW450U (£100 cashback), 47LW550T (£200 cashback) and 55LW650T (£400 cashback). Each set comes with seven pairs of passive 3D glasses. Participating retailers include Amazon, Best Buy, Comet, Currys, PC World, John Lewis, Richer Sounds and Shop Direct Group. Go to the dedicated page on the Sky website to download your claim form. The offer runs from April 7th to June 7th 2011.